To activate it, you need to add "-panorama" as a launch option on Steam. Simply right click on the game in your Steam library, hit properties and then hit the set launch options button and paste it in there. This visual overhaul is the most substantial change to the look and feel of CS:GO since the game was released in 2012. From the Main Menu to the Scoreboard, the entire experience of interacting with the game has been updated. 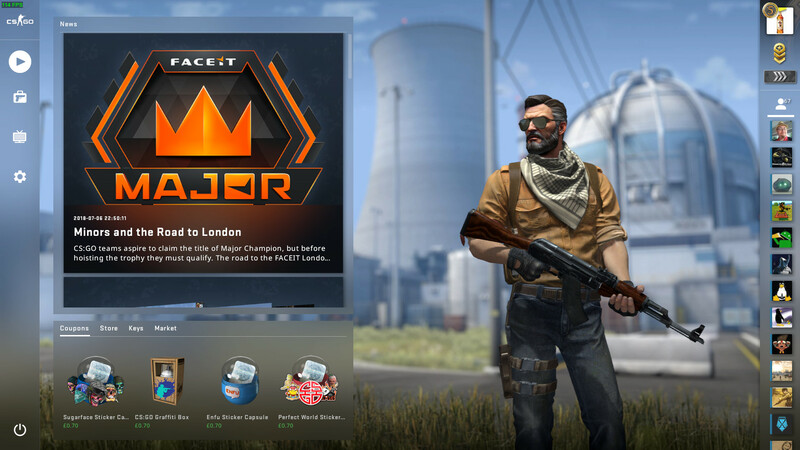 Counter-Strike: Global Offensive was looking rather old, since it hadn't changed too much since the original release back in 2012 so this is quite welcome. It's an absolutely massive change, literally everything is different. It's not the first game to get it though, as Dota 2 got it in a previous update. The minimap was also updated to give a better overview of elevation too and it does look pretty slick. Also, if you had issues with Steam crashing with it on Linux, Valve released an updated beta client to address that too. This is gonna be great! Been checking github for updates on this every day for the past few weeks. Can't wait to get home and try it. chris.echoz This is gonna be great! Been checking github for updates on this every day for the past few weeks. Can't wait to get home and try it. Looks pretty good, but it's kinda unstable (surprise, surprise!). It crashed for me three times in one Wingman. So testing it out seems possible, but using it as 'main' UI is only if you are brave (or foolish?) enough. I'll probably just play against bots at first, also to familiarize myself with the new features. If it crashes or gives me trouble I can just go back. I guess what I'm most excited for is just to try it out first hand. Is anybody hearing a metallic sort of sound being dissipated by any sound generated through the game, like when reloading? It drove me mad and reverted back to the classic UI. Tried changing the audio settings but to no avail. It looks like a totally different game! I think it looks great but I have to try it to see if it’s good. this looks much better . . . the old/current UI looks like a poorly designed website from 15 years ago. MichaelTunnell this looks much better . . . the old/current UI looks like a poorly designed website from 15 years ago. True but I wish they did something about cheaters and raging kids instead. I don’t think reporting does anything at all. I could play two matchmaking games yesterday with panorama. Really enjoy the new look and feel. However, at the moment I need to verify the gamecache integrity everytime I launch the game (1 to 3 files are reaquired every time), otherwise the game crashes on launch. Haven't tested with Steam beta though. Nevertheless, I appreciate that updated UI. This UI looks very nice. I tried it yesterday and unfortunately it lowered my fps from ~260 to 140-190. Kind of heavy if you ask me.